Here is an amazing art project. I wish I could take credit for it but I can't. A former Grade 1 teacher at the school used to do this project with her kids every December. They always left me in awe as they are so striking. This year one of the Grade 2 teachers did a similar project only as a torn paper collage...again very effective due to the high contrast in the composition. Using parts of the template figure out where you want your white center to be. We will be using the white of the paper for this. I lightly marked with pencil where the center will go. Mix some white paint with your blue paint to make a light blue. Start painting around your white center. I wanted to have some brush marks showing movement. If you look at the two finished pieces you can see what I was going for. Continue painting now making your blue darker by mixing in some purple or maybe a little black. Paint until you are right off the page keeping that circular motion in your brushstrokes. Now you can use the template or try to make your own . Trace out your figures on black paper. Use the yellow paper for the star. When you have your silhouettes cut out place them on the paper, you are trying to position your horizon line. Lightly pencil in where you want your horizon line to be. You want to center the Baby Jesus in the white. Mix up a very dark blue, try to make a shade that you haven't already used in the painting. I've seen black used but I think a dark blue looks better as it doesn't compete with the silhouettes. Glue down your black paper cutouts. It's good to start with the Baby Jesus. And there you have a very striking piece for Christmas. Give it a try. Wow that is terrific! Now just to find time to slot it in...if not am definitely using it next year! WOW this is really stunning! You come up with the BEST stuff! I'll be linking. Thanks for posting this:) I tried this with my kids and the pictures turned out beautiful! 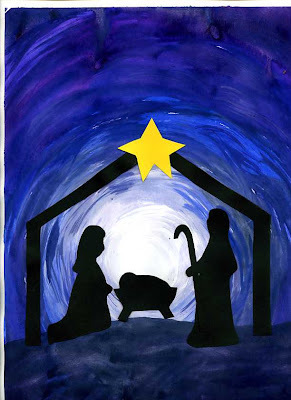 I came across your blog when reading about your Nativity art project on ourjourneywestward.com. You have a great blog with so many great projects...I've already added you to my favorites list. 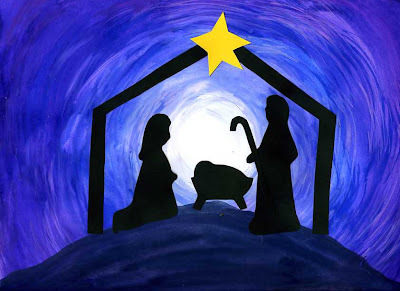 I can't wait to do this nativity art project with my kiddos tomorrow! Thanks! I hope everyone gives this a try. The results are terrific. Thanks for all the comments! This is amazing! Can't wait to do this with my kids! We did these yesterday and they turned out beautifully! I'm so glad found your blog. Thank you for posting this project! Thank you so much for the tutorial. We had a great time doing the project and I think they came out great. We posted the pictures on my blog. This is beautiful ... I think I have a great activity for my kids this weekend!!! Thanks for the instructions, it is a beautiful project. I love this idea! I started it with my senior citizen Liberian Literacy class today. They arrived in the US never having touched pencil, paper or books and not speaking English. After 3 years they can write their names and say all the letters. It's been a long journey! I LOVE these!! We made some today and they turned out beautiful! Do you think there is a good substitute for the paint if we were to do this in our Sunday School class? Church clothes and paint are a scary combo! I love this! I may try it with my class. What do you do with the tape once the painting is done? If you pull it up, won't it tear the paper? Just curious! Thanks - my family has been having a blast learning from this site and doing the projects. Our owls (with the egg carton eyes looks great). Love this - my class will do this for our Christmas project for their parents this year. AWESOME! Thanks for this idea. I was thinking of something like this to make as a banner for my school's christmas concert this week and needed a template and google found your blog for this idea. I made a poster sized version with my boys (ages 3 and 6) tonight to decorate our front window. It is so beautiful I'm considering doing small ones as Christmas gifts for grandparents. Thank you so much for the inspiration! this is stunning. love it. i am writing a series of posts on an Advent Countdown and included your idea. could i use one pic from this post? i would give you credit and link back to you. please email me at getdownandgetyourhandsdirty at gmail dot com. Thanks for sharing this activity... I did this with my kids and it turned out wonderfully! Many other teachers in the school have now taken the activity so they can use it in the future too! I have referenced you and this activity on my blog if you'd like to drop by! Thanks for another fantastic project idea! What a fabulous project! I look forward to trying it with my students. Going to have my oldest try this on a canvas. Sketch in the black pieces then paint. Can you tell me what kind of paint? Watercolor, tempura, acrylic? We attempted this with watercolor, but it was hard to see any brush strokes and movement as pictured. I'm not sure what we are doing wrong, other than I am art challenged. :o) Thanks for your help! Sorry for the late reply but I was on holidays, we use disk tempera but you can also use watercolour. I also do this project on canvas with students and we use acrylic. To see brushstrokes in watercolour sometimes I use less water, I also may paint in a section, let dry a bit and then go back with slightly darker colour to make some brush marks. Hope that helps for next year. love this it is beautiful. Hi Gail. When doing this on canvas, do you paint the nativity pieces or still cut them out and glue to the canvas? Thanks in advance. We paint the background, including the hill or ground for the silhouettes to stand on, and then cut the figures out of black paper, glue into place. We also cut out the star and add a touch of glitter on it and a little iridescent glitter above the baby Jesus on the white part of the background. When everything is dry I add a coat of mod podge. I love this! How long does this take to dry? I'm responsible for a class project next week but we only have a couple of hours and then the kids are going home for the school break so would need to take them with them. Thanks! If they paint the background and then start working on the templates/silhouettes, the background should be dry enough by the time they need to glue. One of my favourites and it always looks amazing! Good luck. I am using your idea in my Sunday School class this weekend to make ornaments!.... Using ceramic ornaments that I bought cheap at Hobby Lobby, and I printed a simple nativity silhouette on clear address labels (Avery 8665). Tried it out this evening with my daughter, and they are beautiful!! Thank you for a simple yet stunning craft idea! Do you have a picture of the completed ornament? Do you permit pinning from your site to Pinterest? Please feel free to pin the pictures and projects. Thanks for asking. Simply beautiful! May we use the image for this year's Vacation Bible School at the Church of the Redeemer in Sarasota, FL?